Yoga’s ability to soothe aches and pains is no secret, and many seek out its healing powers for nagging back pain. More often than not, this pain is related to an imbalance in other parts of the body that then creates a stress in the muscles surrounding the spine. An accumulation of tension in the hips and legs are often responsible for this consistent discomfort, therefore addressing those areas will often pacify backaches. As you explore the postures outlined below, take care not to force the movements and allow them to deepen over time naturally. This restorative yoga pose is wonderful for releasing stored tension in the back and hips. Start in a kneeling position with knees wide and big toes together, bringing a blanket under the knees for extra support if needed. Slowly sink the hips towards the heels as you walk the fingertips forward and rest the forehead down on either the mat or a block. If this feels too intense, try bringing the knees together or taking a bolster under the upper body. As you breathe in, imagine space and length being cultivated in the back body. As you breathe out, soften the hips and the heart further down. Take as much time here as you need, allowing the body to surrender and relax fully. Flowing between cat and cow poses allows us to explore the range of movement in the spine and warm up the back. Make your way onto all fours with wrists stacked under shoulders and knees under hips. If there’s any sensitivity in the knees, tuck the toes under or lay a blanket down for extra support. Spread the fingers wide and let the neck be neutral as you connect to the points of contact. On an inhale, drop the belly towards the mat while lifting the gaze and tailbone. As you exhale, pull the belly button in and press through hands and feet to round the spine. Flow through this motion 3-5 times, making sure to inhale and exhale completely. Twists are excellent for diminishing back pain because they decompress the spine and provide a detox for the internal organs. It’s extra important to move mindfully when navigating twists to avoid worsening discomfort in the back. Initiate the movement in the lower spine and follow the twist up into the neck, avoiding any forceful motions. There are a few different ways to approach a seated twist, but for this gentle variation start by extending your right leg straight while bending the left knee in towards the chest. Plant your left foot flat, moving the heel towards the sit bones, and bring your arm behind for support. Inhale the right arm straight up and exhale to hook the elbow on the left knee. Breathe deep into the lower abdomen, following the twist up the spine and taking your gaze over the left shoulder. Stay for 3-5 rounds of breath before moving to the other side. As with seated twists, there are several variations on supine twists as well. Patiently find one that feels the most therapeutic and beneficial for your needs. For this version, start lying flat on your back with both knees bent at a 90-degree angle and arms out wide in a T-shape. On a breath out, slowly drop the knees to the left while allowing the gaze to track right. If the floor feels too far, try placing a bolster under the knees for some added support. Take as many breaths as needed before changing sides. The entire body can benefit from this popular pose, including the back, legs, arms, shoulders, and chest. This posture provides a particularly great release in the legs, ultimately lessening back pain caused by hamstring tightness. The best way to approach this pose is by starting in a tabletop with hands placed slightly forward from the shoulders and toes tucked. Inhale to lift the knees off the floor, and exhale to send the hips skyward. Press the thigh bones back as you relax through the head and neck. Keep the knees soft as you move into the sensations, pedaling the feet or rocking the hips as it feels appropriate. Breathe into the entire back body for 10-30 seconds before releasing. This traditional standing posture relieves backaches, sciatic pain, and neck discomfort. It provides a great stretch to the muscles along the spine, as well as the hips and groin. When practiced consistently, you’ll notice increased strength in the legs, shoulders, and chest. From a standing position, step the right foot back into a wide stance and dial the toes out. Keep the left toes pointing forward as you raise the arms out parallel to the floor with palms facing down. Hinge forward at the waist, reaching through the left hand as you maintain a straight spine. Drop the left hand down to your shin, the mat, or a yoga block and lift the right arm straight up. Find a comfortable position with the gaze, forward, down, or up. Continue to root down through your base and breathe for about a minute before transitioning to the other side. Sometimes when it comes to alleviating back pain, a gentle backbend is just what the body needs. Sphinx pose is a very mild and grounding way to express backward extension in the spine while strengthening the surrounding muscles. Lie on your stomach with legs extended straight back and tops of the feet planted. Engage the thighs, back, and glutes before bringing the elbows under the shoulders with forearms parallel and palms down. Press down through the arms and pull the elbows in the lift the head and torse up. Engage through the lower belly to support the back while gazing straight ahead for as long as it feels comfortable. Bridge pose is an extremely versatile backbend that can be made restorative or stimulating based on what’s needed. In addition to helping backaches, it stretches the spine and relieves stress-related headaches. Come to a reclined position with arms resting down by your sides, knees bent, and feet flat at hips-distance. Press into the feet and hands to lift the tailbone on an inhale, bringing the thighs parallel to the floor. Arms can stay as they are, hands can move under the hips for support, or palms interlace with forearms rooting down. If you’re in need of a more therapeutic experience in this shape, bring a block under the sacrum and allow the full weight of the body to rest. Relax and breathe deeply for as long as the body desires. Not only does this pose help soothe back pain, but it can also be your ticket to dreamland if you’re having trouble sleeping. Enter with caution, using props if necessary, to ensure you don’t cause further strain on the back or neck. Begin in a stable shoulder stand and start to bend at the hips on an exhale to lower the feet to the floor behind the head. Hands can stay on the lower back or make their way down to the floor with palms down. With every exhale, try to release deeper into this shape and rid the body of any unnecessary tension. If you’re suffering from consistent back pain, it’s more than likely that tightness in the legs is part of the problem. Using forward folds to stretch them is a good idea when done mindfully to avoid creating further stress in the back. The key to alleviating tension with folds is finding ways to let the body fully surrender into the shape. Use the breath as a tool for relaxation and slowly ease into the benefits they hold. Try experimenting with the variations outlined below to find a fold that best fits where your needs are. Take a wide stance with toes slightly pigeoned in and hands on your waist. On an inhale, lift the heart while letting the tailbone descend, and as you exhale, start to hinge forward at the waist. Lead with the sternum before bringing the hands down to the floor, opposite ankles, or grabbing elbows. You could also employ a block here to help manage the depth of the stretch. Actively engage through the legs, isometrically drawing the inner thighs together while pulling energy up from the feet. Continue to notice the cycle of breath and how it influences this shape. Find a comfortable seat with legs extended in front and spine perpendicular to the floor. As you inhale, draw the navel in towards the spine while raising the arms overhead. Follow breath out as you drape the upper body over the legs, using blocks or a bolster for added restoration. Proceed to pull energy up the legs on your breath in, and yield deeper into the fold on your breath out. From a standing position, fold forward from the waist, letting the arms go heavy towards the floor or grabbing opposite elbows. Keep a generous bend in the knees as you make space for the natural curve of the spine. With every exhale, liberate tension from the tailbone to the crown. Find ways to facilitate a more profound spinal release by swaying side to side or shifting weight forward into the balls of the feet. Energetically flow into this backbend, using resistance to relieve stress in the back while addressing tension across the chest. Lie face down with arms by your sides and slowly bend at the knees, flexing the feet towards the ceiling. Reach your hands towards your ankles, and flexibility permitting, grab ahold one at a time. Press the feet into the hands to lift the chest off the ground while reaching the back of the thighs up. Be mindful of your limitations and express patience with the body when practicing this intense posture. 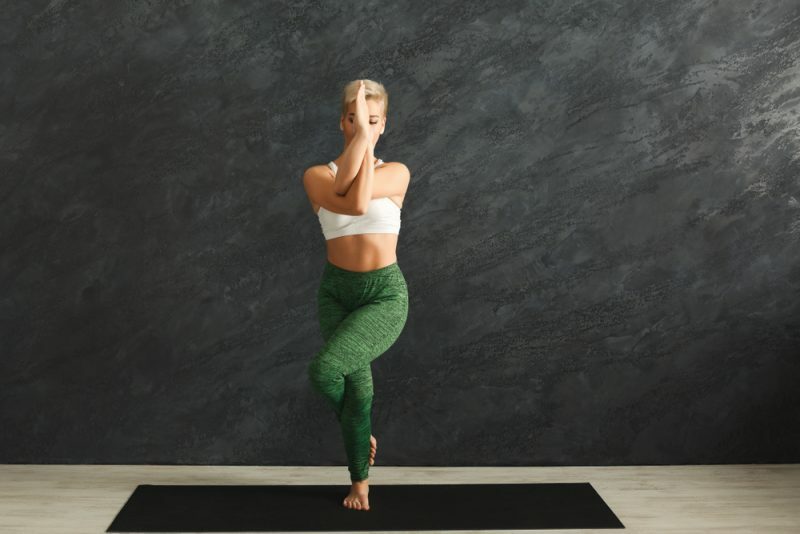 If you can muster up the strength, concentration, and endurance for this tricky balancing posture, you’re back will feel transformative relief. The combination of stability and flexibility gives space for the entire back to open and release. Start standing with feet together, and knees slightly bent. On an inhale, lift your right leg and cross the right thigh over your left. Kickstand your right foot or continue to wrap the foot around your left calf. Bring the right arm under the left, crossing at the elbow, and draw the palms together or just let the backs of the hands meet. Draw the elbows up and away from the body, envisioning an opening through the upper back. Stay for 3-5 full breaths and then slowly release before heading to the other side. Camel pose can be an intense backbend, so go into it with an open mind and respect your limits. Come to a kneeling position, perhaps bringing a folded blanket under the knees for extra comfort. Bring your hands to the lower back with fingers facing up and elbows drawing together. Take a deep inhale to lengthen up through the spine. As you exhale, begin to lean back, lifting the chest and pressing the pelvis forward. Keep the hands where they are, bring them to blocks, or reach for the ankles. Be sure to counter this action with child’s pose immediately after to gradually absorb the benefits of the backbend.